The FACSCalibur can measure up to four fluorescent colors, as well as FSC and SSC. There are two Becton Dickinson FACSCalibur flow cytometers available for use in the facility. Configured with 405-nm, 355-nm, 488-nm, and 633-nm lasers, the LSRII has the ability to acquire up to 14 colors. The LSR II is also equipped with a plate loader option allowing automated throughput screening from 96 or 384 well plates. Download the configuration. Configured with 355-nm, 405-nm, 532-nm, 561-nm, 488-nm, and 633-nm lasers, the LSRII YG has the ability to acquire up to 18 colors. The LSR II is also equipped with a plate loader option allowing automated throughput screening from 96 or 384 well plates. Download the configuration. 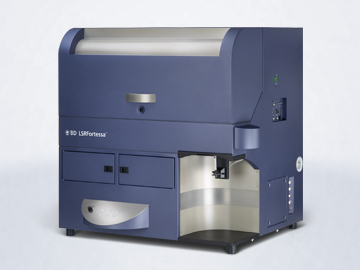 An early access, one-of-a-kind instrument, the Fortessa-X50 is configured with 8 lasers ranging from UV to NIR excitation. The new, low-noise electronics have the ability to acquire up to 28 colors simultaneously. The Fortessa-X50 is also equipped with a plate loader option allowing automated throughput screening from 96 or 384 well plates. Excitation laser lines include 355-nm, 405-nm, 447-nm, 488-nm, 532-nm, 561-nm, 638-nm, and 785-nm. Download the configuration. Please use the Modified Cleaning Protocol for this instrument. This cell sorter is equipped with 355-nm, 488-nm, 561-nm, and 633-nm lasers making 14 color data acquisition and sorting possible. 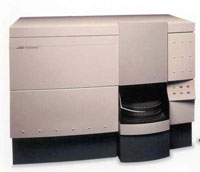 Capable of sorting 4 populations simultaneously, and also single cell sorting into a variety of collection tubes and plates, this sorter is capable of sorting BSL2 samples. Download the configuration. This cell sorter is equipped with 355-nm, 405-nm, 488-nm, and 633-nm lasers making 14 color data acquisition and sorting possible. Capable of sorting 4 populations simultaneously, and also single cell sorting into a variety of collection tubes and plates, this sorter is housed in a Class2A biosafety hood and capable of sorting BSL2 with enhanced precautions samples. Download the configuration. Miltenyi's magnetic cell separation isolated populations of cells which are labeled with superparamagnetic particles conjugated to specific antibodies. After magnetic labeling, cells are passed through a separation column which is placed in a magnetic field. The labeled cells are retained on the separation column and separated from the unlabeled cells which pass through. The retained fraction can be eluted by removing the magnetic field, both fractions are recovered.